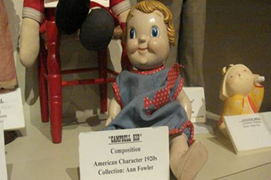 Dolls of December Past: an affectionate look back at dolls–turned-prize-collectables, the exhibit features antique dolls from the collection of the Jefferson County Historical Museum in Pine Bluff. These toys have entertained and inspired the imaginations of children since becoming commercially-available in the mid-19th century. 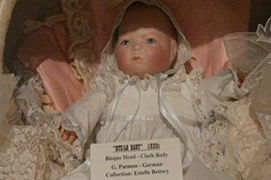 Highlights of the exhibit include a “Bye-Lo” baby doll, whose carefully painted skin tones and glass eyes closely resemble a newborn, and an early example of the famous “Kewpie” doll, modeled on the illustrations of American artist Rose O’Neill that first appeared in 1909. 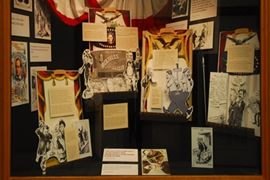 The exhibit will also feature the distinctive paper dolls created and marketed by Arkansas artist Kim Brecklein. The American Presidential Theater: An Affectionate Look Back At Squeakers, Controversies and Close Calls. The Constitution of 1789 created a three- legged structure of government for the new United States of America; one of its most controversial aspects was the provision for a chief executive for the nation. The first president, George Washington, was effectively elected by popular acclaim. His successors, however, have had to campaign for the office and the result has been a tradition of partisan theater. Many presidential contests have been down-and-dirty mud fests, and the combination of the popular vote with the workings of the seemingly-mysterious electoral college system has ensured close races and disputed results. Collages of vintage political cartoons commemorate a dozen of the nation’s most contentious and controversial presidential contests; these range from the elevation of Thomas Jefferson in 1800 to the protracted recounting dramas of 2000. Pious or perplexed quotations from various inhabitants of the Oval Office plus reproductions of campaign materials and seldom-kind caricatures testify to the wide range of emotions the Presidency has inspired. 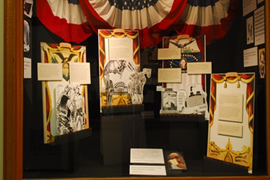 The American presidency was, in Thomas Jefferson’s words, a “splendid misery”; to Theodore Roosevelt, a “bully pulpit; to Lyndon Johnson put it, “The presidency has made every man who occupied it, no matter how small, bigger than he was; and no matter how big, not big enough for its demands.” The American Presidential Theater reminds visitors that while technology has changed and issues have risen and fallen since 1800, many elements of presidential campaigns-overstatement, character assassination, boundless confidence, celebration, ridicule and in the end, for the winner, gloating-have been present since the beginning. Indeed, they may be part of the theater the public expects. 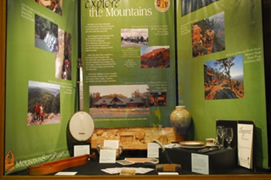 Arkansas State Parks: Seventy Five years of Making Memories: In recognition of the Arkansas State Park’s 75th Birthday the exhibit is both a salute to the vision that created the earliest parks and an invitation to visit the 52 parks and museums that comprise Arkansas state parks system. 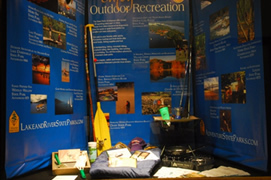 Artifacts, including samples of prehistoric ceramics, vintage tourist literature and a Civilian Conservation Corps (CCC) - made rustic ottoman, and vivid photographs interpret the wide variety of parks and their recreation opportunities. In 1933, on Petit Jean Mountain near Morrilton, the CCC began construction at Petit Jean, Arkansas’s first state park. 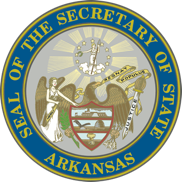 Today, Petit Jean State Park, Mount Nebo State Park, Crowley’s Ridge State Park, Devil’s Den State Park and Lake Catherine State Park endure as legacies to the craftsmanship and conservation achievements of the civilian “Tree Army” of Franklin D. Roosevelt’s New Deal. The hallmark of Arkansas’s state park system is its diversity: mountain and lake parks, recreational destinations, places of natural beauty and of historical significance are preserved within the system.